No opinion about a manufacturer is more trustworthy than that of the industry. The better that opinion is, the more motivated we are. A good dose of motivation was given to us on 13 January 2017 in Łódź during the Cd3D Business Awards Gala 2016.We were awarded in two categories: “Best New Polish Company of 2016” and “Best Polish Manufacturer of Filaments of 2016”. Cd3D Business Awards Gala is one of the most important events in the world of 3D printing. The ceremony summarizes the achievements of the industry and lets the participants exchange their experience. This year it was the second edition and more than 80 people were present. 40 awards were given in 15 categories. 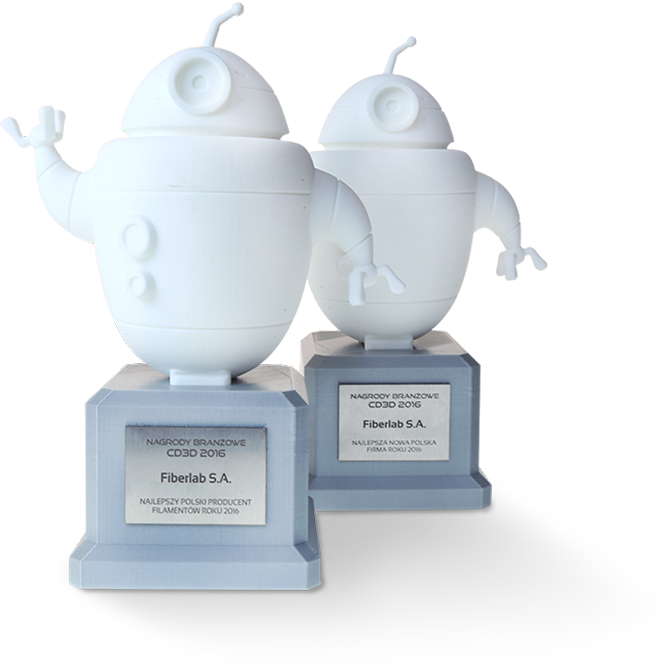 Companies, devices and people from different sectors of the 3D industry were recognized. Fiberlab was among them. We received the most votes in the “Best New Polish Company of 2016” category. We got as many as 244 points which secured us first place. Skriware came second and Technology Applied came third. We also received the most votes (204) in the “Best Polish Manufacturer of Filaments of 2016” category. We believe that the received honours come from the high quality of our filaments and the continuous development of our offer. They also signify the trust our company enjoys. We could not have finished 2016 any better. We see those awards as an incentive to add further filaments to our range and to expand our distribution network.